Roof of the recently restored Shahi Hammam, Lahore, Pakistan. Under the Aga Khan Trust for Culture’s aegis, the conservation of the 17th century Mughal period Shahi Hammam – a public bathhouse in Delhi Gate – was completed in June 2015. 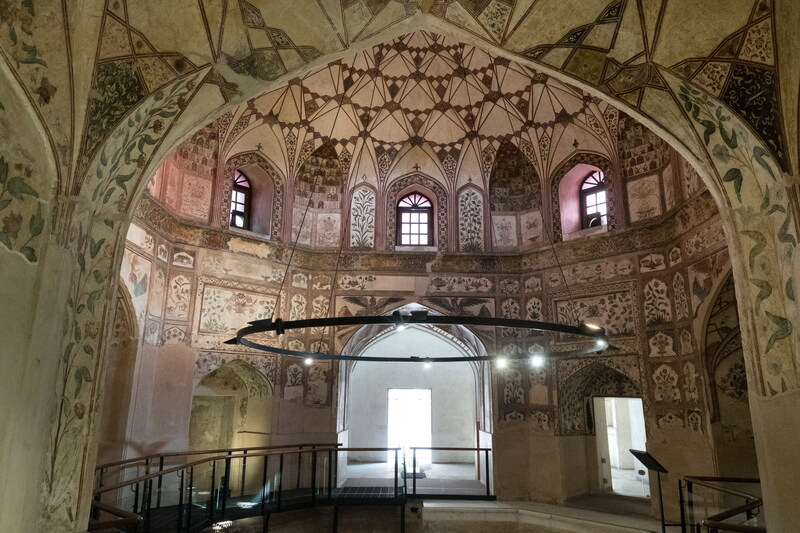 The Aga Khan Trust for Culture, in partnership with the Government of the Punjab and the World Bank, is helping to revitalise the Walled City of Lahore, in Punjab, Pakistan. Inside the recently restored Shahi Hammam, Lahore, Pakistan. 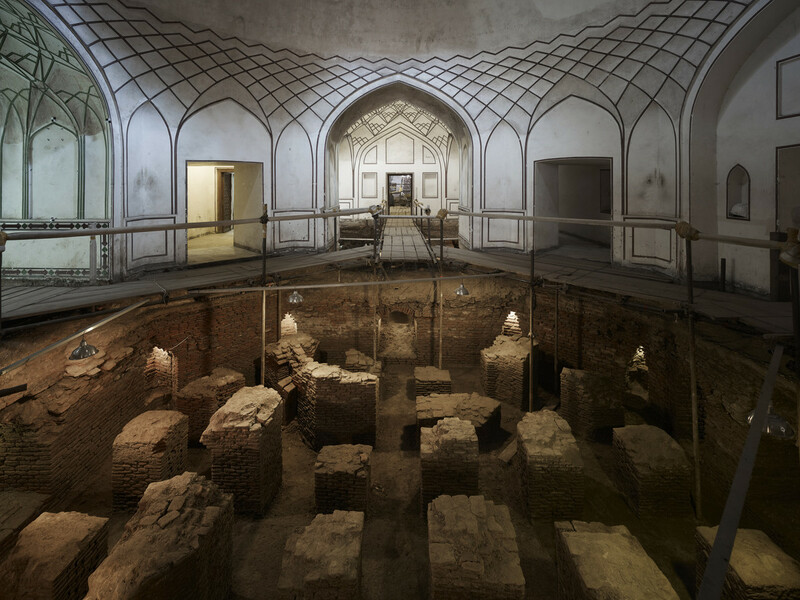 Under the Aga Khan Trust for Culture’s aegis, the conservation of the 17th century Mughal period Shahi Hammam – a public bathhouse in Delhi Gate – was completed in June 2015. 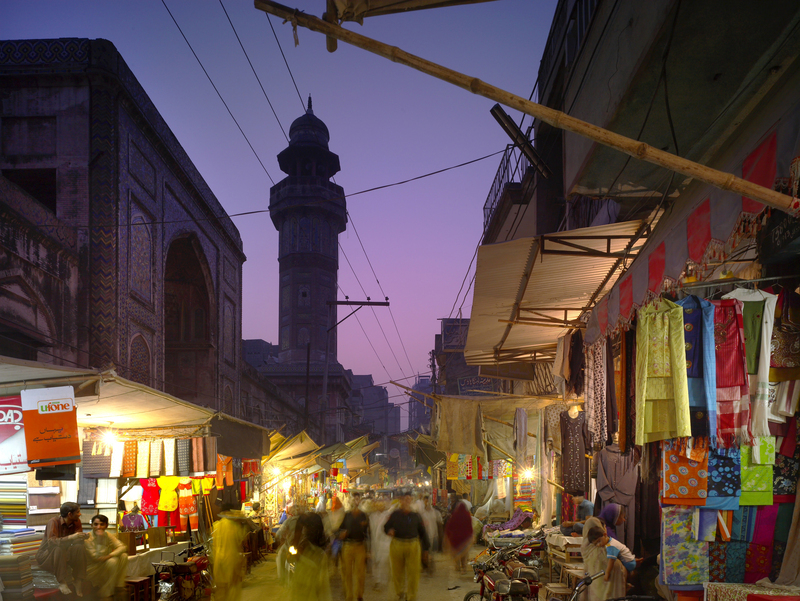 Kotwali Bazaar, looking west along the north facade of the Wazir Khan Mosque, Walled City of Lahore, Pakistan. Wazir Khan Hammam conservation, Lahore, Pakistan : Representative portions of these excavated remains are being stabilized for an ultimate museal display of the findings. Lahore, the capital of the province of Punjab, and the second most populous city in Pakistan, is also known as the "Gardens of the Mughals" or "City of Gardens" due to its Mughal heritage when it served as a vital part of the Mughal Empire (1524 to 1752). This once fortified city has a concentration of monuments and buildings that reflect cultural diversity in architecture, and despite a dynamic and tumultuous past spanning several centuries, has retained much of its historic urban form. 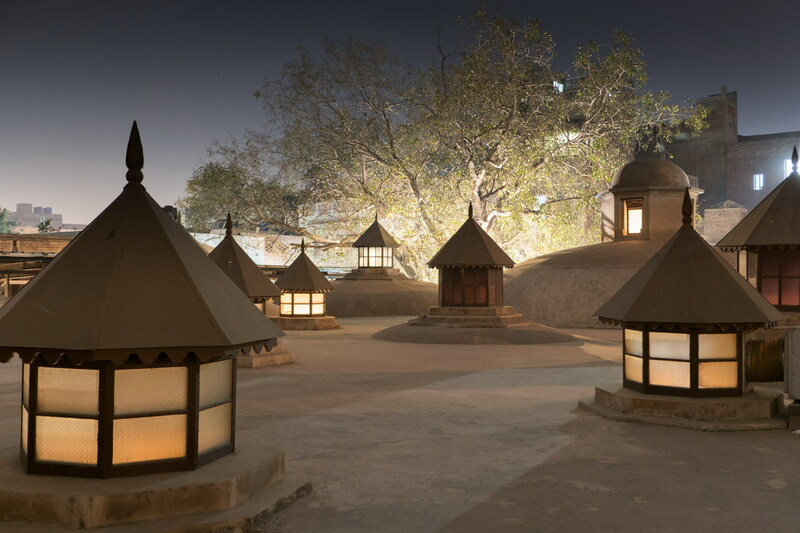 Upon the completion of the Shigar Fort project in 2005, the Government of Pakistan requested that AKTC make technical contributions to the World Bank-funded area development “pilot” known as the ShahiGuzargah (Royal Trail) project, in the Walled City of Lahore. The Walled City of Lahore is famous for several historic monuments, including the Lahore Fort – a World Heritage site – as well as the Badshahi and Wazir Khan mosques. Close to 2,000 buildings within the Walled City display a range of architectural features that mark Lahore’s centuries-old cultural landscape. A majority of these buildings and the mohallas (local neighbourhoods) in which they are situated form a unique heritage footprint. The work consequently carried out by AKTC and AKCSP was initiated under a 2007 public-private partnership framework agreement with the Government of Punjab. The first phase of the project, completed in 2014, was comprised of the design and improvement of infrastructure services and the documentation of major Mughal period monuments. An important social and economic dimension aimed at poverty alleviation and the creation of economic opportunities for local residents was facilitated through community participation in the projects. The technical engagement of AKTC continues currently on the basis of an MOU with the Walled City of Lahore Authority (WCLA). The AKTC assistance programme is likely to continue in the foreseeable future. Upon the completion of the Shigar Fort project in 2005, the Government of Pakistan requested the Aga Khan Trust for Culture (AKTC) to make technical contributions to a World Bank funded area development “pilot” Shahi Guzargah (Royal Trail) project in the Walled city of Lahore. For the pilot project AKTC-AKCSP provided both technical and financial assistance and the project has been subsumed in a Walled city-wide framework of integrated area development. This framework is contained in a Strategic Plan developed in 2008 and supported by physical and socio-economic baseline data established by AKTC’s Lahore office, and by a new GIS system for the Walled City. The GIS database contains parcel level data for 21,800 properties. A sharp decline in population that was registered in the number of people residing in the Walled City. By the time AKTC became involved, the number of local residents had dropped to below 150,000 (down from 240,000 five decades earlier). At the same time, properties of high historic relevance were being demolished or converted into warehouses by the commercial sector. The Strategic Plan emphasises the importance of maintaining a substantial residential population within the Walled City by improving housing conditions and by providing basic social services, thereby arresting further decay and laying the foundation for socio-economic revival. The intention exists among local policy makers to turn the Walled City into a prospective destination for local, national and international visitors. This positive mindset has enabled AKTC to help prepare for the economic development of the Walled City, thereby emphasizing an increase in the numbers of visitors and the creation of employment opportunities for local residents. Under AKTC's aegis, a medium-term infrastructure development plan was prepared for the entire Walled City, integrating the design of different utility services into a phased programme spread over fifteen years. The recently renovated street called Gali Surjan Singh, Lahore, Pakistan. The completed AKTC Gali Surjan Singh project for improved housing has set a high standard for quality. In 2010, the conservation of the Gali Surjan Singh was undertaken as part of a municipal infrastructure improvement programme co-signed with the Government of Punjab, and supported in part by a grant from the German Embassy. GaliSurjan Singh is an offshoot residential street from the Shahi Guzargah, the main boulevard opening through the Walled City’s Delhi Gate, and is comprised of a series of housing establishments as well as small store fronts with a good degree of historic and architectural value. These supplement the more monumental cultural value of historical edifices such as the Shahi Hammam and the Wazir Khan Mosque, adding to the variform aspects of the city’s cultural texture. Before the Gali Surjan Singh project began, streets such as the aforementioned one had historically not been subject to considerations of aesthetic and architectural maintenance nor consonance with surroundings when under the purview of the city’s civic planners, partly due to the lack of regulations on these fronts. AKTC’s conceptual designs, prepared in early 2008, aimed to incorporate the provision of material necessities for the residents of the buildings lining the street with an aesthetic sensibility that looked to rehabilitate the cityscape and skyline.Infrastructure was overhauled by replacing the water and sewerage pipes with HDPE and UPVC respectively, as well as consolidating and reorganising the electricity distribution network using Aerial Bundled Cable, with clamps and fasteners at regular intervals to enable the cable to follow the architectural features of the building facades. Through a combination of technical and social extension initiatives, the project aimed at and completed an undertaking designed to put into practice the revalorisation of an urban heritage space, in an integrated manner, by incorporating the provision of service infrastructure of a robust standard with attention to cityscape improvement and the rehabilitation of the historic fabric. The project established design paradigms for both infrastructure and architecture that the WCLA is replicating on a larger scale in other areas of the Walled City. It was also given an Honourable Mention in the 2014 UNESCO Asia-Pacific Awards for Cultural Heritage Conservation. Inside the recently restored Shahi Hammam, Lahore, Pakistan. In June 2015, the conservation of the seventeenth century Mughal period Shahi Hammam – a public bathhouse in Delhi Gate – was completed. The 1,000 square meter complex was rehabilitated over two years. Interventions included the exposure, conservation and display of the original waterworks, drainage and heating networks, as well as the historic floor level; procedures to arrest the ingress of water and further structural decay; restoration of the original entrance, internal chambers and architectural features including provisions for internal and external illumination. The original frescoes dating from the Mughal period were also conserved. The Walled City of Lahore Authority now manages the hammam as a museum. The Shahi Hammam, built in 1634 during the reign of Shah Jahan, is a bathhouse constructed in the tradition of Persian and Turkish bathing establishments. Despite archeological remains indicating the existence and popularity of smaller bathhouses during the Mughal and Sikh eras, the Shahi Hammam is the only monumental public bathing house in the Subcontinent that survives from that period. Prior to the conservation work, the Hammam’s northern, western and southern boundary walls were appropriated as makeshift storefronts. Parts of the building’s structure were adapted to better serve this new commercial function, and the originally open drains, having been either built over or obstructed, caused water seepage into the building’s foundations, greatly contributing to the exfoliation of lime plaster and the considerable loss of many of the building’s frescoes. The Hammam’s interior had also been arrogated by the public sector and put to use variously over time as a boy’s school, a girl’s vocational school, a dispensary and as an office for government departments. Meanwhile, some of the north-western chambers had been rented out as shops, completing the obfuscation of the site as a heritage monument. Monetary compensation was provided to the local traders encroaching on the Hammam’s exterior walls in exchange for relocation, and a retaining wall was built in order to prevent any future encroachments. The street level surrounding the building was then lowered to its historic level more than two meters below the height at which it then resided, allowing the exposure and display of the totality of its historical facade. During the excavation process, the Hammam’s hypocaust system and furnaces were discovered and informed an understanding of the way in which heated water was routed to various bathing chambers. Conservation work was undertaken on the building’s original entrance and architectural features for internal and external illumination, and 65,000 historic bricks were recycled to restore various sections of the Hammam. The Hammam was opened to the public as a museum-site in July of 2016 and is attracting local and international visitors. Combined with the Lahore Fort, it is increasingly becoming the centre-point for tourism in the Walled City. In 2016, the Hammam received the Award of Merit as part of the UNESCO Asia-Pacific Awards for Cultural Heritage Conservation. The Wazir Khan mosque complex, Lahore, Pakistan. The Wazir Khan Mosque was built in 1634-35 AD (1044-45 AH), by Hakim ‘Ali ud din, subedar (governor) of the Lahore province (1632-1639), during the reign of the Mughal Emperor Shah Jahan. It was the largest mosque in Lahore at that time, with the Badshahi Mosque construction still fifty years away. Located about 260 meters inside Delhi Gate, the Wazir Khan Mosque complex sat astride the Shahi Guzargah (Royal Trail), surrounded by the dense organic fabric of the Walled City. The complex included the mosque itself, the Chowk (an urban introductory space), a row of hujras (shops) that were integrated in the entrance system meant specifically for calligraphers and bookbinders, and additional shops on the eastern and northern facades built into the body of the monument. The profuse architectural decorations that embellish its exterior and interior surfaces are a singular outstanding attribute that places the mosque in the frontline of the major monuments of the world. In 2009, a comprehensive documentation of the Mosque was carried out and published in 2012 by a technical team of conservation architects and engineers from AKCSP in order to determine the range of problems and issues faced by the Mosque. One of these issues was the stability of the foundation of the mosque, which were threatened by commercial encroachments and eight feet of cultural fill. As efforts to secure funds for the conservation of the entire Mosque were bound to take time, a practical approach was adopted to initiate the conservation in phases. The conservation and rehabilitation of the 85-meter long northern façade of the Wazir Khan Mosque was completed in June 2016 with financial assistance from the Norwegian Government and AKTC and with facilitation by the WCLA. The project involved the reclamation of the original street level, adaptive reuse of the restored hujras as shops to be let out for controlled commercial activities by WCLA, illumination of the façade and rehabilitating the northern façade in such a manner that it forms a template for the conservation of the entire mosque when the latter is put into effect. O Chowk e a Mesquita de Wazir Khan estão no coração da Cidade Murada de Lahore, Paquistão. Rehabilitation of the Chowk Wazir Khan, the 800-square-meter historic forecourt of the Wazir Khan Mosque, was initiated in the last quarter of 2015 with funding from the United States Ambassadors Fund for Cultural Preservation (AFCP) and AKTC, and facilitation by WCLA. WCLA took charge of removing and compensating the commercial encroachments that were lining the Chowk and occupying the hujras (chambers) in the eastern facade of the mosque. This was carried out by a contribution of US$ 300,000 from the Government of Punjab. The conservation project aimed to reclaim the urban space by lowering the Chowk to its original level, excavating and restoring the eastern façade and hujras of the Wazir Khan Mosque, conserving the Calligraphers’ Bazaar and the dewrhi of the mosque, excavating and conserving the Dina Nath Well and rehabilitating the urban open space for the benefit of the community. Conservation of the eastern façade utilises the experiences gained on the northern façade with regard to the architectural decorations, taking recourse to international laboratory testing of materials through AKTC as well as similar work being done in Afghanistan. The goal was to reclaim the Chowk for re-use as an urban public space in the congested Walled City by making it an attractive and inviting space allowing for a range of activities such as qawwali performances, local melas, and special events, particularly taking account the ambience on the evenings. Work was completed in July 2017; the first major event was held on 14 August 2017 by WCLA celebrating 70 years of independence. 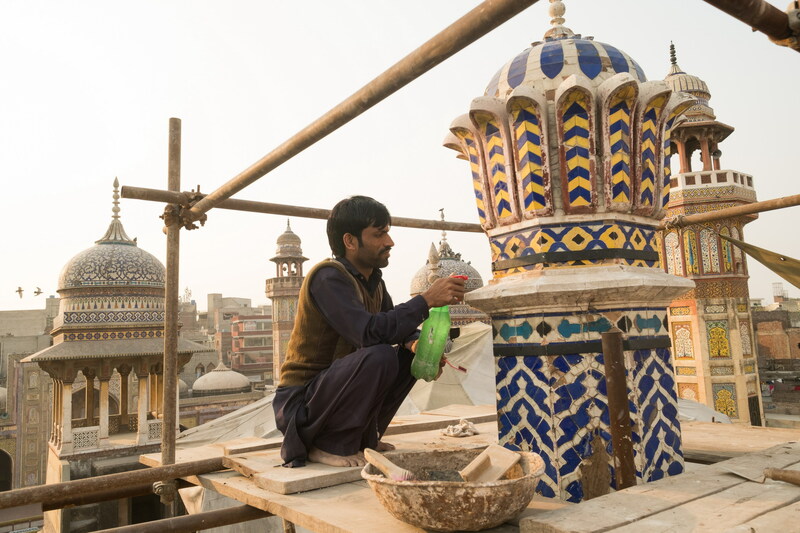 In 2017, the Government of Punjab approved a PC-1 of a sum of US$ 5 million over a period of five years for the conservation of the Wazir Khan Mosque proper. View over the picture Wall, Lahore Fort, Pakistan. In September 2015, AKCSP began documentation of the Lahore Fort Picture Wall – a mural that adorns the Fort and the principle reason for the site’s inscription on the UNESCO World Heritage List in 1981. The Picture Wall is a 442 meter-long mural spanning the northern and western facades of the Lahore Fort, with an average height of 15 meters. It is adorned with glazed tile and faience mosaics from the Mughal era as well as embellished brickwork, filigree and frescoes. It runs from Hathi Pol (Elephant Gate) to Jahangir’s Quadrangle. Once exposed to the riverside, the Picture Wall was exquisitely decorated during the Mughal period in the reign of Jahangir in 1624 AD and completed under Shah Jahan’s reign in 1632 AD. While the mosaics do not form a contiguous narrative, they do give an account of the themes that preoccupied the royal court of the era – battles (human and animal), angels and demons, fairies, dance and music. AKTC’s engagement with the site started in September 2015 with the documentation of the “Picture Wall” followed by the documentation of Lahore Fort in its entirety, with funds provided by the Royal Norwegian Embassy. The project has since moved on to include planning for the rehabilitation of the Fort and improving conditions within a buffer zone along its southern and eastern edge. The Lahore Fort Initiative aims to catalyse socio-economic development in the historic Walled City by revamping the tourism management system of the Fort and reactivating currently unused spaces to generate revenue. In 2017, the Government of Punjab approved a PC-1 of a sum of US$ 9 million over a period of five years for the conservation of the Lahore Fort and its monuments. Lahore Fort Complex (Shahi Qila), Shahjehan's Quadrangle, the Diwaan-e-Khaas, Lahore, Pakistan. The Strategic Plan for the Walled City is being implemented in phases involving different sections. In the areas of the Walled City where AKTC has concentrated its efforts, the expected impact is and will be noticeable with regard to the number of rehabilitated monuments, improved housing conditions for local residents, improved access to utilities by these residents, improved access for visitors to historic monuments and improved safety on the street. The completed AKTC Gali Surjan Singh project for improved housing has set a high standard for quality. The impact of this project has been such that this effort is already being replicated on a larger scale by the Walled City of Lahore Authority. The project was recognised by a UNESCO Asia-Pacific Heritage Award in 2014. The removal of makeshift retail outlets that for decades have obscured important historic monuments along major arteries within the Walled City, as well as the rehabilitation of these monuments, is already having substantial visual and psychological impact – leading to an increase in the number of visitors to the area. Obras de renovação na Mesquita de Wazir Khan - O Fundo Aga Khan para a Cultura, em parceria com o governo de Punjab e o Banco Mundial, tem ajudado a revitalizar a Cidade Murada de Lahore, em Punjab, Paquistão. Growing awareness about Lahore’s historic and socio-cultural importance, particularly its Mughal heritage, among prominent businessmen, political leaders and the higher educated, as well as their acknowledgment of the high standards of AKTC’s conservation and rehabilitation efforts, has led to a number of key partnerships. These ones include the Government of Punjab, the Walled City of Lahore Authority, the World Bank, the Royal Norwegian Embassy, the Embassy of Germany and the US Ambassadors Fund for Cultural Preservation.